Is this or is this not THE most beautiful underwear you've ever seen? Frills, lace, pink detailing, bow and a cute heart on the bra strap - what more could a girl ask for? This set is part of the Tutti Rouge collection at Large Cup Lingerie and is by far, the girliest and nicest underwear I own. 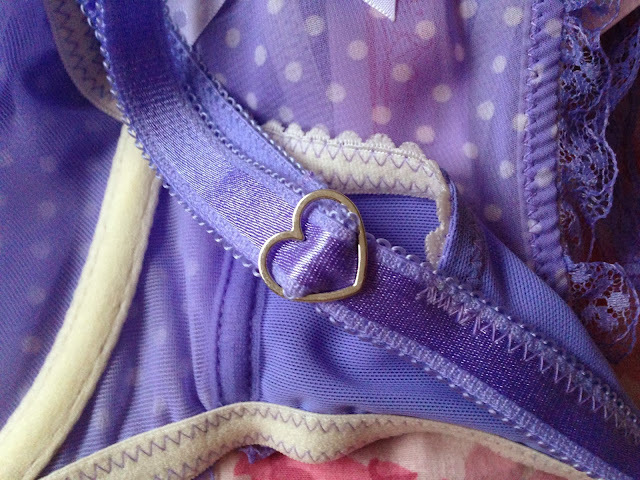 The detailing and little added extras make you feel like so much thought has gone into designing this set and there is finally an underwear brand that knows what kind of thing women want to wear. The fit for me is amazing too, the underwear is so comfy and flattering. I love the balconette style of the bra, it really suits my body shape and the frills underneath the cups are just perfect. I just can't get enough of how pretty it is. I struggle to find nice bras for a reasonable price because my back is quite small, but this bra is a tiny £20.80 reduced from £26 from Large Cup Lingerie (link here) a huge bargain if you ask me. I will certainly be shopping with Large Cup Lingerie again and I would definitely pick up something from the Tutti Rouge collection in the future - I have my eye on the Betty bra to try next!